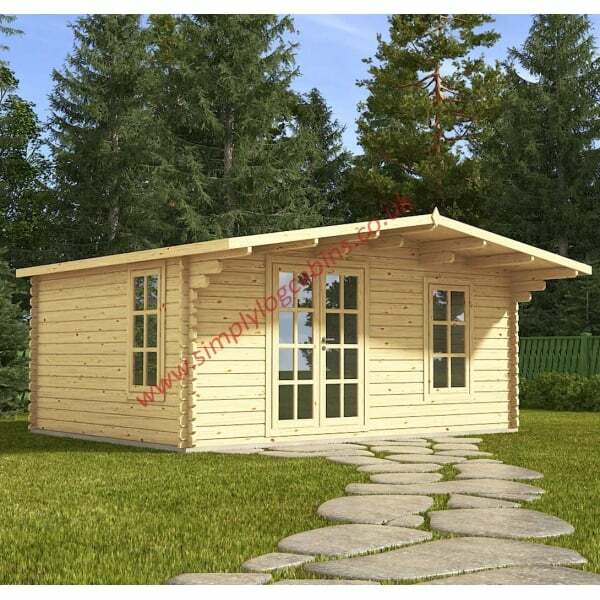 Eurovudas Head Office 1 Log Cabin: The Eurovudas Head Office 1 features two separate rooms with the smaller room being accessed from the larger room as per floor plan. The main room is designed as the perfect garden office or extension to your living space or just a simple leisure room to enjoy in the garden. The smaller room being as shown on plan or a kitchen / archive area if the building is to be used as an office. The generously proportioned main room features a large double door and also 2 x Single Windows which, combined create a light and airy atmosphere in which to work or play whilst the smaller room has a solid wood door without any glass for added privacy. The Eurovudas Home Office 1 offers and ideal combination of leisure and practical with the two rooms or it can also be put to any number of uses including hobbies where a separate dark room is required. The main room is well lit and ventilated which creates a light and airy environment that is a space too rest, play or work in winter and summer. Constructed from high quality North European North European Spruce and including Double Glazing.